It is a crack-of-dawn Saturday. An American Airlines jet and a Delta Airlines jet are carrying a cargo of 72 Jacksonville and Sarasota Ski Club members (and their bulky gear). We are all in eager anticipation of arrival in the snowy Rocky Mountains we are being whisked to. Indeed, I have been told by more than one friend in the west that this is the best ski conditions seen in Colorado in the past 30 years. A total of 950 Florida ski club members are simultaneously descending upon the Vail/Eagle airport for what promises to be an unforgettable, week-long trip. Our departure from the Jacksonville airport is delayed for 30 minutes, as it takes quite a while for the Sunshine State skiers to cram and squeeze all their winter attire into our overhead bins. Surprisingly, as our airline glides into the snowy Rocky Mountains, we learn that our rather large jets are able to fly into Vail/Eagle despite the rather modest size of the airport and its surrounding communities. It soon becomes clear why this is possible. We quickly discover that the airport regularly receives hundreds of skiers from all over the nation and world. The location is, after all, in the heart of some of the best ski mountains in the known universe. Our charter bus brings us to the Crestwood Condominiums, which will be our home for the coming week. Looking out of our balcony through the sliding glass doors, we are pleased to see the main Snowmass ski lift downslope and a short distance away from our unit. It will be an easy ski-in, ski-out experience. Most of us then visit Incline Sports Ski Shop to rent our ski gear. We must be ready to go to the lifts first thing the next morning! The first morning is glorious. We are greeted by clear, cobalt-blue skies, and slopes that are blanketed by fresh, groomed powder from the previous week of snowfall. First mountain to conquer for us is Snowmass. 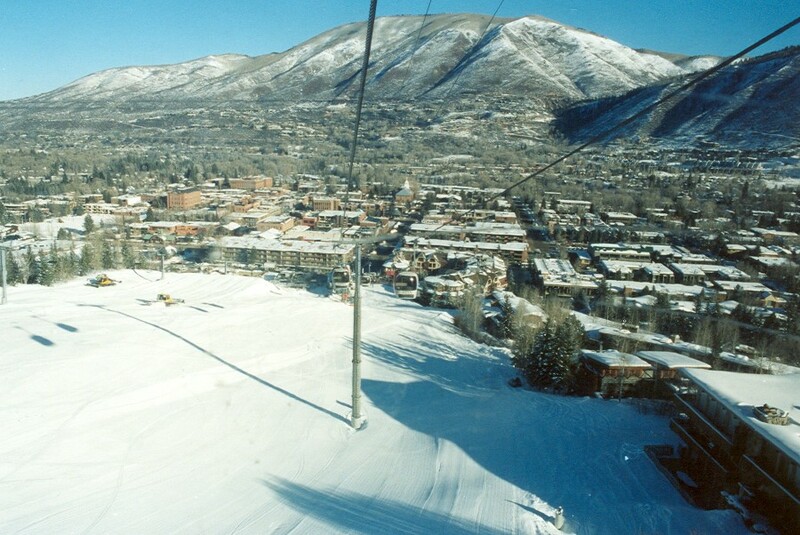 Located in the vicinity of Aspen, Snowmass stands on its own as a ski destination. Snowmass ranks among the top 10 resorts in America in size, and it's the second-largest in Colorado (after Vail). It covers more than 3,100 acres—more than Aspen Mountain, Buttermilk and Aspen Highlands combined. And thanks to a surface lift to the top of the Cirque, Snowmass has the longest vertical drop in the United States at 4,406 feet. The Village Express lift launches us to the waiting trails, which are served by 21 lifts. On the way up, we get a breathtaking view of the astonishing, remarkable snow-capped mountain peaks surrounding the region. 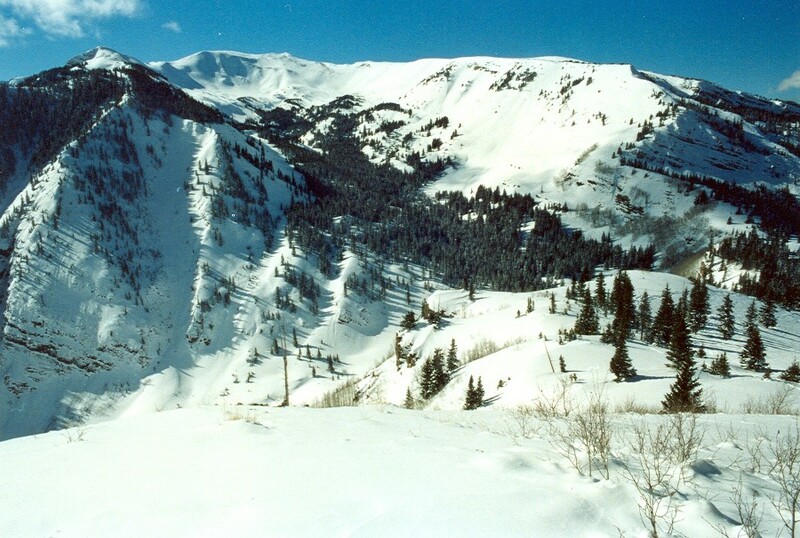 Snowmass Mountain has an elevation of 12,510 feet at its top with, again a vertical rise of 4,406 feet. There are 3,128 ski-able acres here. Average annual snowfall at Snowmass, Aspen and Aspen Highlands is 300 inches. Approximately half of the ski trail mileage is intermediate in skill level. Snowmass turns out to be the most diverse ski experience of the three mountains I ski this week. 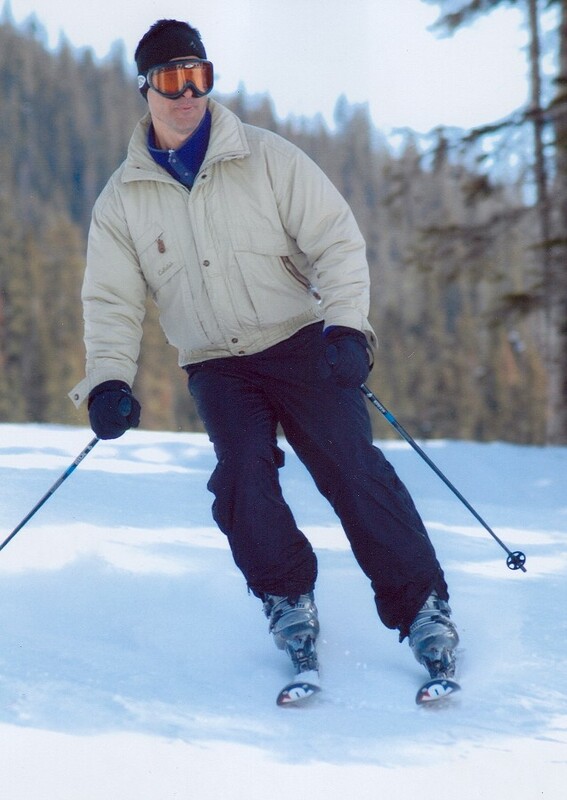 The most enjoyable, gorgeous, exhilarating, intermediate (blue) trails on this mountain are Upper Green Cabin (a wild, high-speed blue trail), Bull Run (which allows the skier to slalom and cruise through large pine trees for a meaningful distance, and so enjoyable that I run it 4-5 times – the photo shows me cruising the Bull…), Sandy Park (another fun blue cruise through a pine slalom course), Bear Bottom, Naked Lady (named due to its sloping ski curves? ), Grey Wolf, Funnel (another high-speed cruiser trail), Banzai Ridge, Ute Chute (apparently a little-used, hidden trail off of Banzai that we are happy to plummet down at a screaming speed), and Sneaky's. While ascending on one lift, I notice to my right that the Slot trail, a groomed, wide, black diamond, seems quite doable for a strong blue skier such as myself, so I happily make it my only black diamond run for the week. 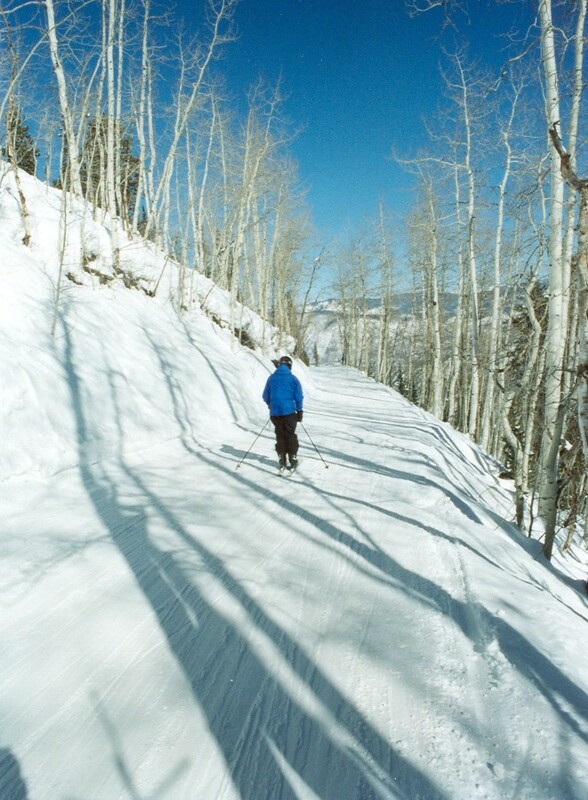 The long, high-speed blue cruiser trail that I most enjoy on Snowmass is a combination of Upper Green Cabin, Coffee Pot, Green Cabin and Fanny Hill, although the combination of Bull Run and Funnel are certainly a thrilling experience as well. Overall, I am impressed by the large percentage of blue trails on Snowmass. The mountain has average quality trail signs (sufficiently visible, but a number were missing, which creates problems for the newcomer), and an adequate array of quality restaurants and cafes dispersed throughout the slopes. Snowmass is larger and more diverse than Aspen Mountain or Aspen Highlands. I am disappointed in Snowmass Village, however, as it is more of an outdoor mall than the romantic, quaint, human-scaled Alpine-village-like experiences I've enjoyed at places such as Vail Village. However, Mountain Dragon and the Blue Note, as well as the Apres at the Cirque Bar and Grill turn out to be enjoyable visits for music, good beer and dancing. The second day of skiing finds me hopping the shuttle bus for Aspen Highlands just down the road from Snowmass. The ski map makes this mountain seem somewhat intimidating, as the mountain appears to be top-heavy with steeps and black diamond trails. The lengthy, sustained blue cruiser trail on Highlands is the combination of Broadway, Hayden, Meadows, Wine Ridge, Prospector Gulch, Memory Lane, and Jerome. Highlands tops out at 11,675 feet, with a vertical rise of 3,635 feet. There are 970 acres of ski-able terrain here, and over half of the trail mileage is black or double-black diamond (yet there are sufficient blue trails for an intermediate-level skier to enjoy the mountain). Like Snowmass, Highlands has average quality signs for trails. Visible signs, but some are missing. The next morning finds me shuttling to Aspen Mountain. Again, the weather is gloriously sunny and calm. A good percentage of trails are groomed. There are three magnificent, long, blue, high-speed cruiser trails on this mountain. First, there is Ruthie's Run and Summer Road. Perhaps the most utterly enjoyable, screaming-descent experience here are the Copper trails, which funnel into Little Nell. Dipsy Doodle and Spar Gulch is also a highly pleasurable run. Aspen Mountain rises to 11,212 feet, with a vertical rise of 3,267 feet. There are a modest 673 acres of ski-able terrain on Aspen Mountain, but a lot of good skiing is packed in that small area. Like Highlands, over half of the trail mileage is black or double-black diamond, yet is still a wonderous place for the blue skier. Signage on Aspen Mountain is better than at Snowmass or Highlands. Fewer missing signs. Overall, I find Aspen to be somewhat more enjoyable than Snowmass or Highlands, largely due to the larger number of long blue cruisers. As a side note, I am pleased to report that none of the three mountains require any meaningful amount of energy-draining poling up inclines. Nearly always, the skier finds downslopes going from trail to trail. On Wednesday, I walk the compact Town of Aspen in the mountain valley, which I had viewed at the base of Aspen Mountain from my gondola ride the day before. Quality, walkable, space-enclosing urbanism is found here, although I am disappointed by Main Street, which is a hostile, unpleasant, five-laner. One thing is clear when observing people walking the streets in Aspen. This is where the beautiful, perfect, wealthy people live. A stop at a real estate office confirms this as well, with houses being offered for over $7 million in the current real estate listings. On my last day, I ski from my condo to the Snowmass lift to return to my favorite runs on this mountain. Conditions could not be better. I finish in time to shuttle to Buttermilk, where the parking lot is jammed with trailer trucks from ESPN and other major national media. They are reporting live on the annual "X Games" being held here. As my bus approaches, a strong white glow fills the sky ahead of us, as the X Games are bathed in a Las Vegas-like intensity of lights. Spectators are admitted free of charge, and I stake out a spot next to the Super Half Pipe to watch some of the world's best snowboarding women acrobatically rocket down the pipe. I turn the other way to watch motorcyclists do back-flips and other impossible feats as they soar into the air from a nearly vertical ski jump. All week, the weather and powder are nearly perfect. No lift lines. Almost no skiers on the slopes. I feel like I am skiing my own personal mountains. The lack of lift lines means that I ski an unusually large number of runs each day. Thoroughly satiated and exuberant at the end of a full day of hurtling down the slopes with a big smile on my face, singing happily as I negotiate trails at break-neck speeds. As is so often the case in skiing in the Rockies, the staggering scene of the soaring, snow-capped peaks surrounding you and dwarfing you creates the distracting temptation of gazing at the mountain ranges and not paying attention to what is ahead of you on the slopes (such as a wayward skier or a treacherous drop-off). At the end of each day, I soak for over an hour with fellow club skiers in the spa just outside our condo units. The spa sits next to one of the ski slopes, so we are able to gaze at the mountains as we luxuriate in the soothing, warm, bubbling water. A therapy that is a daily essential, particularly after the first day, when my quadriceps are burning in searing pain (Florida flatlanders don't find their quads being called on in Florida to negotiate the weight-bearing activity of downslopes on Colorado mountain terrain, even if we work out at the gym on a regular basis). Overall, the Aspen/Snowmass area is a premier ski destination in the nation. I intend to return for another dose of soaring, gliding bliss in the future.